We are a rural, family-run business on the south west side of Fairford. Established over 15 years ago, we only employ qualified technicians. 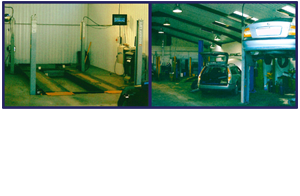 All the latest equipment ensures we provide the best quality service required for your car. Senior Technician, Rob, has been in the trade 30 years and provides a good knowledge of older classic cars as well as up-to-date vehicles. He has previous main dealer knowledge. Rob has achieved motor technician qualifications on Jaguar and Range Rover. All makes and models are serviced and repaired. We do electronic diagnostics, air conditioning and class 4 & 7 MOTs. Earlier drop off time and later collection time available on request.